Vegetarian diets confer multiple health benefits—except when they don’t. As dietitians know, with the exception of medical nutrition therapy required to manage certain nutrition-driven disease states, diet (or nutrition) is not a black-and-white issue. There are many ways to build a healthful, nutritionally sound diet for the individuals who come to us for nutritional guidance. But when it comes to a vegetarian diet, there are clearly right and wrong ways to go about adopting this healthful way of eating. In my practice, I often see adolescent and teenage girls who’ve decided to “go veg” without any inkling of what’s involved in cutting out the meat—except cutting out the meat. The most common reason that I hear for making the leap to a vegetarian diet is concern for our animal friends; children don’t typically decide to drastically change their diet in an attempt to lower their cholesterol or risk of heart disease. Yet for one of my young clients, that’s exactly where the focus needed to be. When she was 5 years old, Emma* asked her older brother where chicken nuggets came from. It upset her terribly to learn that her meal was originally part of a live chicken. She was so affected by this information that even six years later, she cried while recounting the conversation to me. But while Emma was honoring her commitment to protect animals, her vegetarian diet was not really protecting her health. My now 11-year-old client stood 5 ft, 4 inches and weighed 165 lbs with a BMI of 28, a hemoglobin A1c of 5.5, and HDL and LDL cholesterol readings of 36 mg/dL and 120 mg/dL, respectively. If “going veg” is so healthful, what was going on? It didn’t take long to connect the dots. There is a history of obesity in Emma’s family and, according to her mother, Emma has always been a big kid. While she consistently measured in the 95th percentile for height and weight, her doctor had pointed out a significant upward trend in Emma’s weight over the previous two years. Emma was a lacto-ovo vegetarian who “really didn’t like vegetables,” and a review of her three-day food log and overall eating habits revealed many sugary drinks and cheesy, high-fat choices. For example, one day of her food log consisted of two Belgian waffles with syrup, strawberries, and skim milk for breakfast; a veggie sub and barbecue potato chips for lunch; and a grilled cheese sandwich, French fries, lemonade, and a cupcake for dinner. One could argue that this is a fairly typical meal for an 11-year-old and question the availability of all of the nutrients that are important for any growing child, vegetarian or otherwise. While this example represented only one day of intake, further exploration of Emma’s diet revealed that education on a healthful vegetarian diet was critical. The issue was not really a question of whether the “diet” was effective in protecting Emma’s health but a matter of filling a knowledge gap to support her health with a plant-based diet. A 2005 poll showed that 3% of 8- to 18-year-old children were vegetarians.1 While it’s impossible to translate that percentage into actual kids, here’s what you need to know should one of them happen to show up in your counseling office. While it’s been well established that a vegetarian diet can be healthful and adequate in nutrition, children and teens do require age-appropriate intakes of nutrients. Especially important for vegetarians are protein, calcium, iron, zinc, vitamin D, and vitamin B12 in amounts sufficient to support growth and development.2 Guidance from parents in making deliberate food choices helps maintain balance and variety, ensuring that nutritional needs are met. The No. 1 cry of moms everywhere relates to how their child will get enough protein. Age-dependent protein needs for children range from 16 to 44 g per day.3 For many people, protein is synonymous only with meat, fish, and fowl. Provide a list of protein foods that includes beans, peas or lentils, nut butters, soy foods, and eggs (for lacto-ovo vegetarians) and teach your client how to build meals around them. The American Academy of Pediatrics recently doubled the amount of vitamin D it recommends for infants, children, and adolescents to 400 IU per day beginning the first few days of life.4 Vegetarians can get vitamin D from fortified foods, supplements, and sunlight exposure. The requirement for vitamin B12 is tiny but critical. Steer clients toward fortified cereals, fortified soy and other nondairy milks, fortified veggie meats, and cow’s milk, eggs, and yogurt for lacto-ovo vegetarians. Sufficient calcium intake can be obtained from a variety of plant-based sources, but fortified orange juice as well as soy, rice, almond, and other plant-based milks are an easy and efficient way to help meet kids’ calcium needs.3 Fill in the gaps with fortified breakfast cereals, almonds, almond butter, and blackstrap molasses. Getting enough zinc isn’t typically on new vegetarians’ minds, but vegetarian diets often contain less zinc than nonvegetarian diets.5 Because this mineral is a critical component in so many functions of the body, it’s wise to point out good food sources. Luckily there are many kid-friendly options, such as veggie burgers, dates, almonds, and cheese. A good multivitamin also helps cover the bases. 2. Physician’s Committee for Responsible Medicine. Vegetarian diets for children: Right from the start. 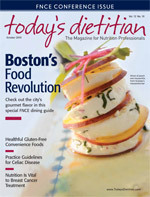 Available at: http://www.pcrm.org/health/veginfo/veg_diets_for_children.html . Accessed June 2010. 3. Melina V, Davis B. The New Becoming Vegetarian: The Essential Guide to a Healthy Vegetarian Diet, 2nd ed. Summertown, Tenn.: Healthy Living Publications; 2003. 4. American Academy of Pediatrics. New guidelines double the amount of recommended vitamin D. October 13, 2008. Available at: http://www.aap.org/pressroom/nce/nce08vitamind.htm . Accessed June 2010. 5. The Vegetarian Society. Zinc information sheet. Available at: http://www.vegsoc.org/info/zinc.html . Accessed June 2010. • Top pasta with marinara sauce for the vegetarian and meat sauce for meat eaters; serve a green leafy salad for all. • Roast marinated tofu in the oven alongside a roasting chicken; serve all of the same side dishes. • Heat canned refried beans for a taco filling while a meat-based filling simmers on the stove; serve all of the same toppings and Spanish rice as a side.